IF YOU COULD HAVE any data set, what would it be? Global maps cross-referenced with traffic alerts? Location data on the boy you want so that you can track him all around the city and get an alert when he's in your neighborhood bar? A list of the salaries of everyone in your giant corporation? Or how about the name of every person who bought a copy of Jacqueline Carey's latest novel so you can form an "I hate cliffhangers" reading group? Asking people about what superhero power they want is so early-20th-century. These days, it's all about emulating omniscience by having the biggest, coolest and most hackable data set. Imagine knowing everything about, um, something, and then using that knowledge to save the world! It could happen. Unlike gaining the ability to fly or become invisible, info-omniscience is physically possible. The only thing stopping you is access to information. And, perhaps, your conscience. Although I'm all in favor of liberating certain kinds of datalike maps, for examplethere are other kinds that I think should never be made available to anyone. That's why I was particularly squicked to hear about a new product from Hewlett-Packard and Microsoft that is designed to be an integrated identity-tracking suite for repressive government regimes. Called the National Identity System, the product is touted for its ability to create smart ID documents, which can be checked at borders or across entire regions. It also has the fun ability to add biometric data to each identity profile. It's plug-and-play surveillance! Now you don't need to build your own repressive state apparatus, because HP has done it for you. Plus HP and Microsoft promise to set up training centers all over the world to help governments implement the system. Luckily, it's Windows-based, so my favorite hackers will be exploiting the hell out of it as soon as it gets widely deployed. I can't wait for the underground how-to book to come outthey can call it National Identity System Hacks. Speaking of cool hacks to massive amounts of data, the forces of whimsy have brought you a terrific new O'Reilly book called Mapping Hacks, by Schuyler Erle, Rich Gibson and Jo Walsh. The whole point of the book is to teach you how to customize the wealth of free mapping services available onlineeverything from MapQuest to Google Earth. This book is the perfect antidote to HP's National Identity Systemit's about unfettered mobility and public access to geospacial information. Mapping Hacks shows you how to create car navigation systems, share your favorite urban hikes with friends or just randomly explore the globe using government satellite data. One of my favorite chapters is called "What to Do If Your Government Is Hoarding Geographic Data." Turns out the United States is one of the best places to go for free maps if your government isn't handing them out. Who knew? This generosity on the part of the U.S. government comes as a particular surprise to those of us who watched our favorite sources of data sharing receive a slap in the face in the U.S. Supreme Court's decision on MGM vs. Grokster. It was the court's first chance to make a ruling on the legal status of peer-to-peer file-sharing networks, and I suppose it's not surprising that the justices' ruling was incoherent and vaguely repressive. They decided that companies or people who make tools for sharing data can be sued if there's evidence that they "intended" for people using those tools to infringe copyrights. This is creepy for several reasons. One, the court left very vague what exactly it would mean to "intend" for people to infringe. Do you intend people to infringe if you don't spy on them to make sure that they aren't? Maybe. Also, the court suggested that future lawsuits about this "intention" theory will require software developers to hand over emails, meeting notes and other internal documents to prove that they never once said something that might appear to encourage people to share copyrighted materials. So basically all my favorite data-sharing tools may get sued out of existence, or at least forced to hand over so much private information that their businesses will become mired in a tar pit of legal discovery. It may be depressing, but I refuse to surrender hope. As long as there is data to be shared, people will push to share it. Our sharing may go underground, and we may have to hack HP's National Identity System, but at least we'll have good maps. 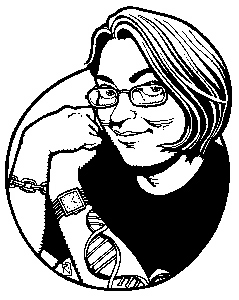 Annalee Newitz ([email protected]) is a surly media nerd who wants a system for tracking government officials.